I first met Carol in January 2009. She came to me a couple years after the birth of her second son. Carol was unhappy with the way she looked and felt. She was going to the gym several times per week, but was not seeing any results. Admittedly, she was frustrated and needed a change. Soon after starting a training program with Carol, I knew she would succeed in reaching all the goals she set for herself. Over the course of the eighteen months, Carol never missed a single workout and always came ready to train hard. Each day she gave no less than 100%. Through personal training and nutrition counseling, Carol has shed 32 lbs. of body fat and has lost several inches. 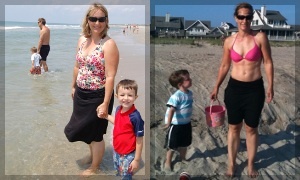 What she has gained are years to her life and a long-lasting dedication to health and fitness. I’m proud to call Carol both a client and a friend. I admire her attitude and tenacity. She has become an inspiration to her friends and family – a perfect example of what hard work and persistence can achieve. From the first moment I met Carol, I could tell in her eyes that she was truly ready to seize the day. Nice work Carol!